We have all agreed that avocado toast is the bomb right? (Do people still say “the bomb?” I don’t care. I still say it.) 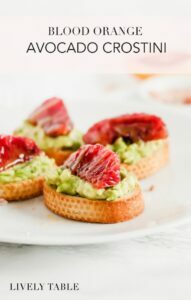 If you haven’t agreed, go ahead and jump on the bandwagon, because I have come up with a super delicious mini variation for citrus season: Blood Orange Avocado Crostini! 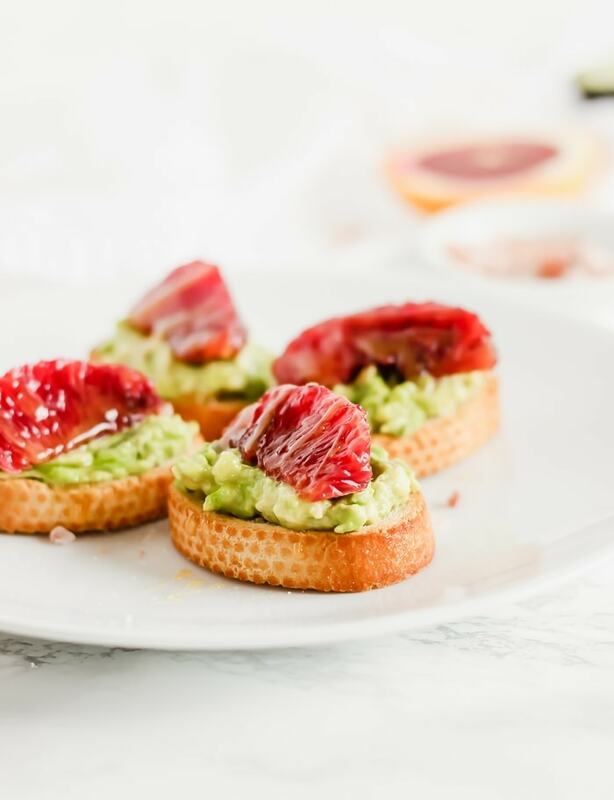 These mini avocado toasts are the perfect afternoon snack or appetizer for any party! They have the delicious taste of your favorite avocado toast, but with the added yumminess of seasonal blood orange. You already know that my husband and I love blood oranges, and they seem to be hard to get our hands on sometimes, even when citrus fruit is abundant this time of year. So when I do find them, I try to use them in everything! 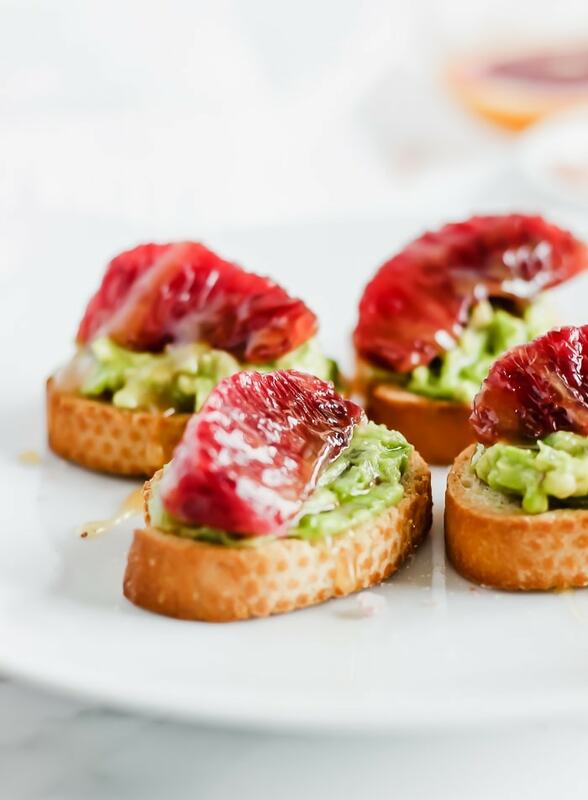 These Blood Orange Avocado Crostini are an unexpected but delicious combination. 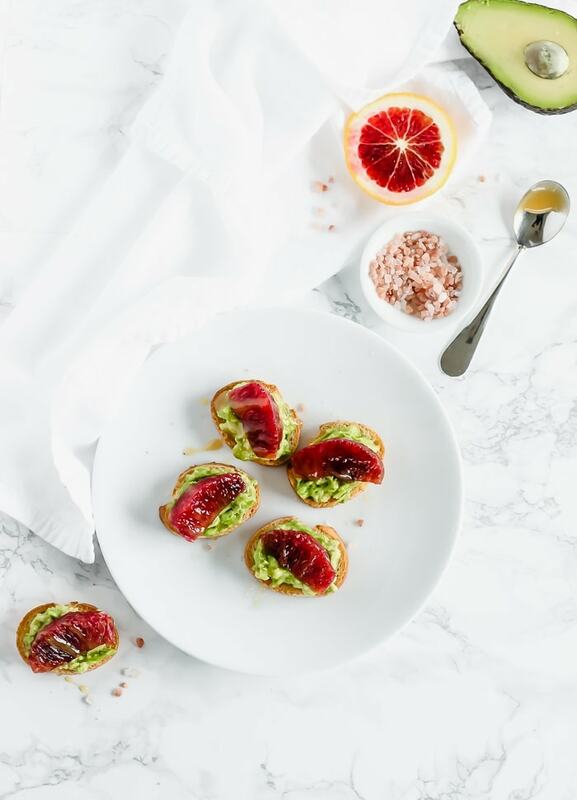 The sweet blood orange with creamy avocado are so yummy with a sprinkle of sea salt and drizzle of manuka honey. Plus crostini are just so prefect with anything! 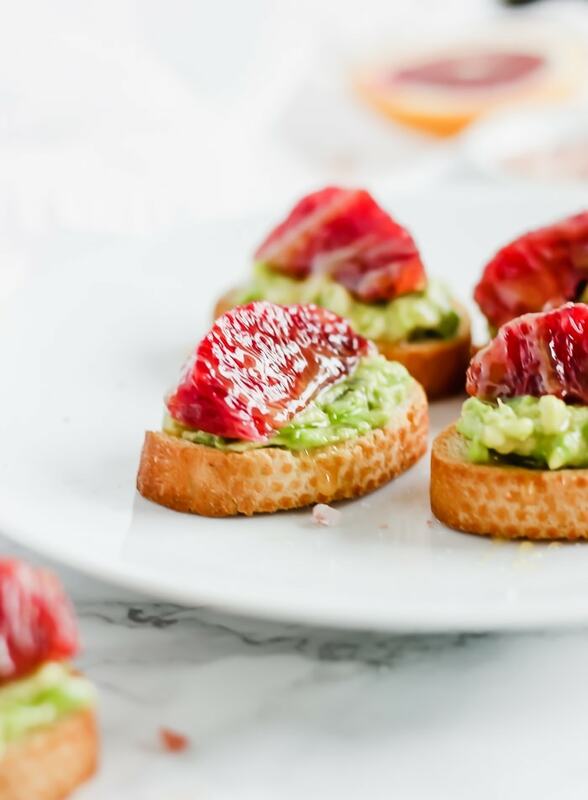 And the avocado provides healthy fats while blood oranges provide plenty of vitamin C.
Serve these at your next gathering (like, ahem, your Super Bowl party, and you’ll be a hero for bringing such a healthy and beautiful snack. People will not be able to get enough. No matter which team wins, you know you will! Heat oven to 400° F. Slice baguette into thin slices (about 1/4 inch thick) and lay slices on a baking sheet in a single layer. Once oven has preheated, place baguette slices in the oven and bake until toasted, about 10 minutes. Meanwhile, scoop put avocado and mash. If it will be a while before serving, squeeze some lime or lemon juice into avocado mixture to keep it from browning. Slice peeled blood orange into thin slices and cut each slice into quarters. Once baguette slices are toasted, remove from oven. Let cool before spreading 1-2 tsp of avocado onto each toast slice. Place 1 or 2 orange quarters on top of avocado. Drizzle each piece with honey and sprinkle with sea salt. Stunning colors! This is definitely an appetizer I will be trying, thank you! Oh my goodness – your photos are so pretty! And this flavor combo is so YES! Thank you so much, Anne! I’ve been putting blood orange on everything! Ha! I still say it! Ha ha! Love these toasts. 🙂 Great combo. 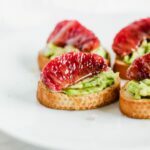 What a gorgeous recipe, and the combination of the avocado, blood oranges, and balsamic sounds absolutely perfect! Wow! I want to try these for the color alone, but the flavors sound like they go so nicely together also! So creative, Kaleigh! Great picture! So simple and delicious!